Wow! It has been a crazy few days here at the all-new KBS! I just want again say thank you for your patience as we work out the kinks and transition ourselves into our new home! If you want real-time updates, please check out our Facebook page. We started sending codes out to those classes affected by the import glitch (see Friday’s post below). The rest should go out today. They need to be staggered a bit because it causes an unusual high amount of traffic on the site, as you can imagine. :) Makes it run a bit slower when that happens. And because I don’t like posting without a photo, I thought today would be a great day to share another weekly spread out of my travel journal. [ Designs | Snowflake. Stamps | Ashland (alpha) + Thankful (now). I used some drafting tape like washi tape and stamped over it. Funny thing is, no matter how much you practice for a perfect stamp, it always seems to mess up when you need to do it for reals. Doh. I also cut the snowflake out of vinyl so I could transfer the delicate shape into the book adhesive-free. Love vinyl! And sometimes I like to type my text, print it + trim it, and adhere it on a page. I like variety, plus it keeps it even more simple than handwriting. And great news! The sale on kits and classes has been extended through Presidents Day! Use code HELLOAGAIN at checkout to save 40% on orders of $15 or more. 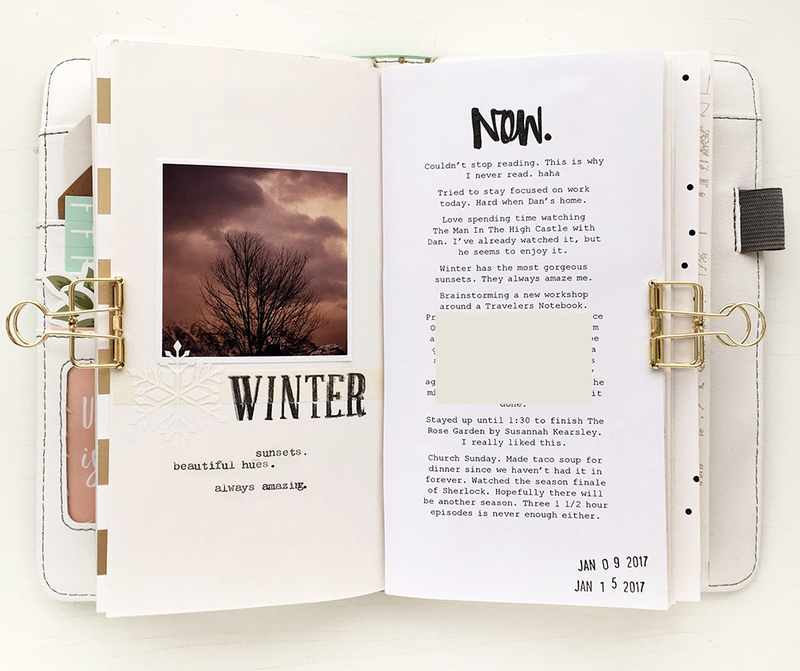 Kerri, thanks for the tip on printing your journaling and gluing it in! I was trying to figure out how you did that!!! Love the look ??? ?